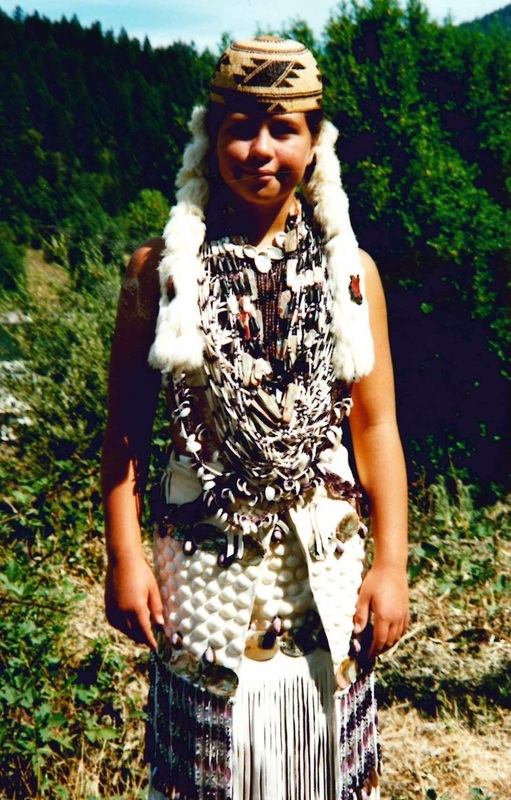 Dressmaking among Hupa ,Yurok, Karuk, Wiyot and Tolowa people comes in one basic style of construction - an inner apron tied at the waist worn within an outer skirt. Placement and method of ties may differ slightly, but a similar style of dress is found in most Northern California tribes according to anthropologist Aflred Kroeber (Handbook of the Indians of California, 1925), and is being revitalized among various other tribes. “this would seem to be an abbreviation of the usual woman’s dress of the Plains. From the hips down, a wrapping of deerskin formed a sort of separate skirt. Or, this might be replaced by a fringed apron of northern Californian type.” (311). 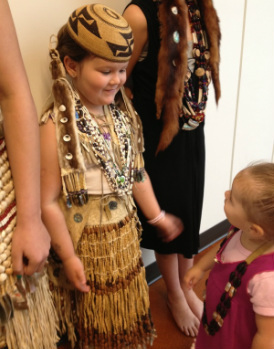 The amount and placement of fringe on skirts also differs between dresses, dress makers, tribes and regions. Dresses also differ in ornamentation. More everyday buckskin dresses (although rarer today) are made plain without much ornamentation, as sitting would break materials on the dress. Elaborate shell ceremonial dresses are made for participation in ceremonies and worn for special occasions such as gatherings, cultural demonstrations and even graduations. The type of dancing done in such dresses is also considered by dressmakers. 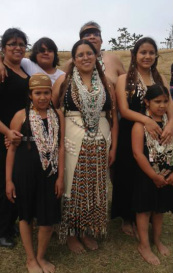 For example, Tolowa dresses tend to have more solidly pieced and connected aprons and skirts to protect the shells while dancers dance across in front of a line of dancers quickly. 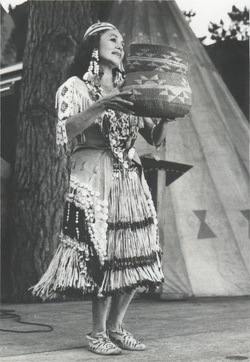 Some brush dance regalia owners make a similar consideration for the type of dresses worn by medicine girls who dance across in an up and down motion, or they use primarily bear grass aprons that are less likely to break. Some dressmakers also choose not to use the color red apart from some red present in abalone, or prefer all natural materials to glass beads, though as soon as trade beads were introduced they were readily used. Dresses older than 100 years are known to have incorporated glass trade beads, thimbles, bells, silver dollar coins, and other trade materials. Every dress has a story... click a pic to read more!